Will Jake Fromm be able to make plays consistently through the air to keep the Alabama defense from loading up the line of scrimmage? 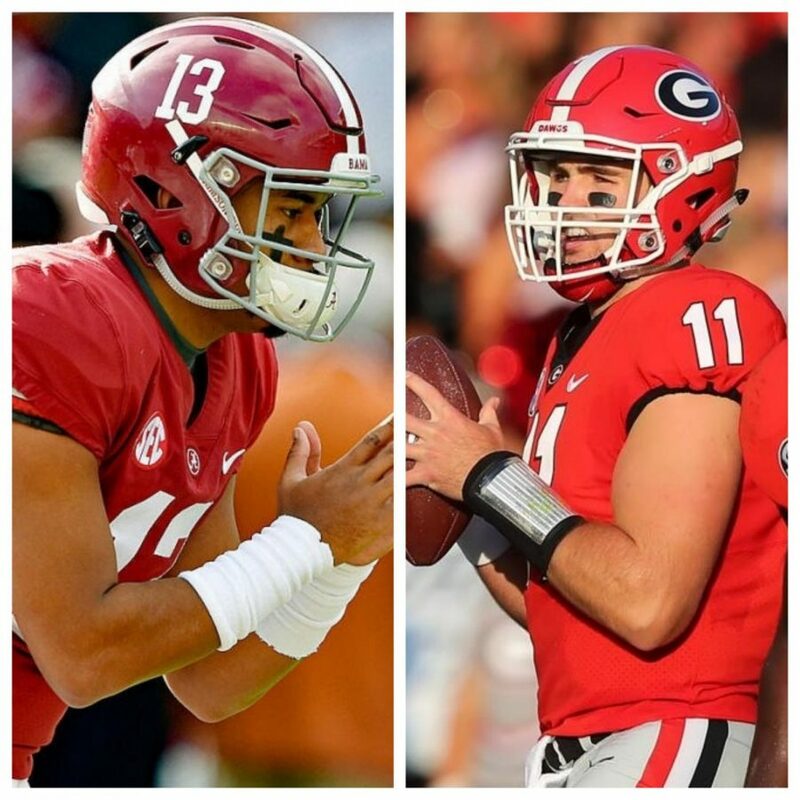 Will the Georgia defense be able to force Tua Tagovailoa into any mistakes? 3. Can D’Andre Swift and the Georgia skill position players create enough explosive plays to keep up with Bama’s potent offense? Jake Fromm will have more more passing yards and TDs than Tua Tagovailoa. Georgia will hold a lead up until the fourth quarter. Alabama will force Georgia into 3+ turnovers. The SEC Championship serves as a play-in game for the College Football Playoff this season, as the number one ranked team in the nation, Alabama, will take on the fourth ranked team, Georgia, in the Mercedes-Benz Stadium this Saturday afternoon. Alabama enters this game undefeated, as they have been destroying teams with the nation’s fourth best offense (averaging 49 points per game) and seventh best defense (allowing 13.8 points per game). The Crimson Tide’s quarterback, sophomore Tua Tagovailoa, is the leader in the race for the Heisman Trophy, the award for the nation’s best overall player. Tagovailoa enters as perhaps the most talented player in the country with a nation-leading 212.5 passer rating (the overall rating of a QB’s performance. He is joined by a plethora of studs at the running back and wide receiver positions, and has one of the most talented defenses in the country to back him up. It will be tough for Georgia to pull off this monumental upset, but the Dawgs hung with the Tide in last season’s national title game, and are equipped to do the same this season. Jake Fromm has had a solid second season as UGA’s starting quarterback and has proven to be reliable and effective in big game. His veteran leadership will be needed, as will the Georgia rushing attack. D’Andre Swift is one of the most explosive running backs in the country and will be a challenge for Alabama to handle in this game. RB Elijah Holyfield (son of legendary boxer Evander Holyfield) compliments Swift’s style with his large stature and bruising running. Georgia has a couple of wide outs that can make plays, as 6’2 Jeremiah Holloman and Riley Ridley have become matchup problems for smaller DBs on the outside. The Georgia defense is incredibly young after losing so much from last season but still is loaded with talent that can slow down the prolific Alabama offense. Alabama is, rightfully so, a comfortable favorite in this one as they aim to secure a 5th straight playoff appearance, but Georgia will likely be the toughest team they’ve faced all year. Revenge will be on the mind of the Bulldogs after last season’s heartbreaking defeat in the National Championship Game at the hands of the Tide. This will be a physical, defensive battle between two tough and smart teams that will not give up much ground. Thus, this should be a fairly low-scoring contest for much of the first three quarters as both sides feel each other out. Georgia desperately needs to get their running game going, not only to help their own offense, but to keep Tagovailoa and the Bama offense of the field. If they can do that, and force Alabama to make some mistakes that they usually do not make, then UGA will have a great chance to win when it comes to the fourth quarter. Still, Alabama just has too much offensive talent to be contained for four quarters, and it must be expected that they will manufacture a couple explosive plays late in this game to pull ahead and steal back the SEC crown from Georgia.